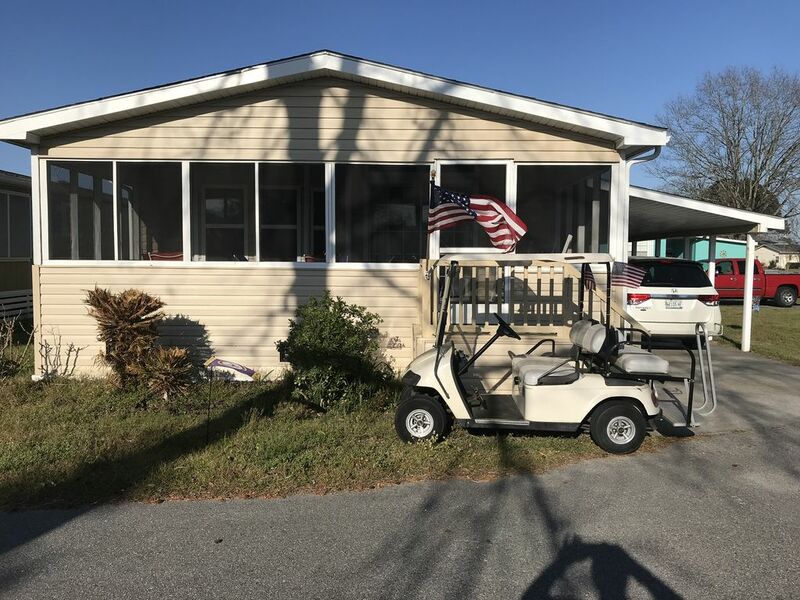 2BR/2BR Sleeps Seven- FREE GOLF CART & WIFI/APRIL & MAY SPECIALS !!!! BIKE WEEKS OPEN, MAY 11 to 18, OCEANSIDE VILLAGE !!!! Looking for a great place to vacation at the beach. 'A LITTLE BIT OF HEAVEN' is the place to be. Check out our beautiful beach villa located at Oceanside Village, Surfside Beach, South Carolina,a private gated community with 24 hours security. We have four beautiful fishing lakes,tennis courts,basketball court,large softball field,volleyball court,bocce court,horseshoes, Pickle Ball Court, Shuffle Board, Enclosed DOG PARK, and lots of walking space. There is also a playground area for small children. The village is located on approximately 180 acres. FOR THIS YEAR there is also a FITNESS CENTER. However, there is a charge per person per week, ($25.00) Open 5:00 A.M. until 10:00 P.M. each day. We do furnish a golf cart and WIFI Free with the rental. Our home features two bedrooms with two bathrooms, both with walk-in showers. Master bedroom has KING SIZE BED, guest bedroom has a QUEEN-SIZE bed and a SINGLE BED and the living room has a QUEEN-SIZE FUTON sleeper. Also, our beach home offers a large kitchen with an island surface unit, built-in microwave oven, full-size washer and dryer, iron and ironing board, ice maker, dishwasher, garbage disposal, blender, toaster, Regular coffee maker, Keurig Coffee Maker, dining room table and chairs for Six and lots more! THREE COLOR FLAT SCREEN TV's with cable, VCR and BLUE RAY DVD player/Radio/We HAVE ALSO ADDED HIGH SPEED ROADRUNNER(WIFI(lite)INTERNET SERVICE FOR YOUR COMPUTER. It is Free. We have a large bar with bar stools and dining room table. Our den area is very large and comfortable. Our home has approximately 1450 square feet including the screened in porch. VERY IMPORTANT- PLEASE READ !!!!!!!!!!!!!!!! We ask that you provide your own paper products and garbage bags. WE DO NOT FURNISH LINENS OR TOWELS ANYMORE. YOU WILL NEED TO BRING YOUR OWN LINENS AND TOWELS. YOU CAN ALSO CALL VACATION EQUIPMENT & RENTAL SERVICE FOR LINENS AND TOWELS. WE ALSO NOW HAVE A CLEANING FEE OF $70.00. This way when you get up on Saturday morning you will not have to clean the home. It will all be taken care of by the cleaning lady. ATT.ENTION SNOWBIRDS: WE ONLY RENT THIS PROPERTY FOR FIVE MONTHS IN THE WINTER. NOVEMBER 1ST TO MARCH 31ST. RATE IS $1095 PER MONTH AND NO SALES TAX OR HOSPITALITY TAX. FREE GOLF CART & WIFI !!!!!!!!!!!! We have three 3) pools, two (2) are outdoors and the other one is enclosed and heated. They both have kiddie pools. Our home is approximately 1 to 2 minutes to the pools and approximately 3 to 4 minutes to the beach by golf cart. Also, we have a large screened-in front porch with table and chairs and rocking chairs for your pleasure. The large carport has an enclosed outside shower (hot & cold water) on our corner lot.There is also a GAS BARBECUE GRILL and CHARCOAL GRILL for your convenience. A GOLF CART IS PROVIDED (FREE) for easy access to the pools and beach with private beach parking. You must be 21 YEARS OF AGE and have a valid driver's license to operate golf cart. We ask that you smoke on the porch or in the carport. We only rent our home to families. We rent our home from Saturday to Saturday in the summer and fall. (FIVE MONTHS ONLY IN THE WINTER- NOVEMBER 1ST TO MARCH 31ST, NO SALES TAX AND NO HOSPITALITY TAX IN THE WINTER. YOU MUST BE 25 YEARS OF AGE TO RENT THIS PROPERTY !!!!!!! WE ONLY RENT TO FAMILIES !!!!!!!! Hello my name is McKenzie (Kenzie) an I am 16 years old April 16, 2015.I have been renting four to six places for 14 years now. It is a lot of work but my Moma & Daddy help me so we all love it very much. We have two (2) places now as we are all slowing down. Please look at both of our Listings an if we can help you please let us know. All of them have a GOLF CART, WIFI, & GAS BARBECUE GRILL. I really like riding on the golf cart as I get to see a lot of my friends through out the village. So please give us a call an you will like riding on the golf cart too. If you have a doggie friend please bring them with you. I just love to meet new friends. (There is a DOG FEE) We appreciate your business an look forward to hearing from you. Thank you. We just love Oceanside Village. We came down seventeen (17) years ago an fell in love with the place. The most wonderful people in the world live in OSV. The private parking lot at the beach plus the showers an restrooms really makes a plus in the summer time. Also the restaurant located on the beach in the parking lot is a plus too. We furnish a golf cart with this rental unit an we have had numerous customers thank us for the use of a FREE GOLF CART. Going to the beach an pools an just 'joy' riding inside the village on the cart is a wonderful experience. Also we offer FREE HIGH-SPEED INTERNET (LITE) (WIFI) Service) We also furnish a Gas Barbecue Grill and regular old time charcoal grill. Take your pick. Yes, we do furnish gas for the gas grill. 2 FULL BATHS !!!!!! (1) w/ 5’ WALK-IN SHOWER & (1) w/4’ WALK-IN SHOWER !!!!! (3) Cable TV's, Gas (BBQ) Grill, 24 hour security, FREE GOLF CART & WIFI !!!!!!!!!!! Sandle Wood. Really felt like home. See you next year! Great little place. Has everything you would need. Thank you so much for the kind review. Glad you enjoyed your stay. If we can be of service to you in the future please do not hesitate to contact us. Nice clean cozy home. Golf cart a plus. Hope to stay again. an hope to see you again in the future. Oh my!!! Where to start? Before we found Gail and Stan we had been staying at another home in OS village, yes it was nice there but we could not bring our babies with us( 2 poodles). Now for 2 years in a row they get to have a vacation with us. Stan is such a sweet person and will do any and everything to make sure your stay is perfect. The house is just the right size for us and always clean. It has all you can possible need. AC when it is too hot outside. We love the screened in porch (to keep the mosquito away), we play games and games in the evenings. It is so peaceful and so much to do without even leaving the village. We drive the golf cart right up to the beach and it just a few steps in the sand. We are so blessed to have found this place and plan to enjoy our Sept. vacations here each year. Thank you for your kind words. We have been renting four places now for thirteen years an we try our best to make sure every guest has a nice clean villa to stay in while they are visiting with us. We are not perfect but we try our best. We appreciate your comments an will see you again next year. We gave been staying here for approx 10 years. The whole family loves this area, grandparents, family and grandchildren. A great place to stay and great hosts. God bless you Stan and Gail. Thank you so much for your kind words. We appreciate renter's like you an your family. I did not realize you had been staying with us for 10 years. I knew it had been a long time however, 10 years is unbelievable. We strive to make all of our renter's feel at home when you visit with us. God has really blessed us in the rental business for some 13 years now. We have truly been blessed by him. We were blessed again to be able to enjoy our second Thanksgiving here. We love the home and enjoy riding the golf cart. Our dog, Mya, also loves riding the golf cart. This year my mom was able to go with us and she loved everything about the home. Stan and Gail are wonderful people. We love our conversations with Stan. We are looking forward to our next visit!!!! PICKLE BALL COURT, SHUFFLE BOARD COURT AND DOG PARK !!! SWIMMING POOLS, HOT TUB, ETC. After you rent from us one time we never require a security deposit again. Your first refundable security deposit is also returned to you. This will make it so simple for you an me. WE DO NOT FURNISH LINENS OR TOWELS ANYMORE. ALSO MONTHLY RATES ARE FOR TWO (2) PEOPLE ONLY !!!!!! CALL ME IF YOU HAVE A QUESTION !!!!!!!! YOU MAY HAVE VISITORS !!!!! Any question please call me (FIVE MONTH RENTAL ONLY - NOV 1ST TO APRIL 1ST.